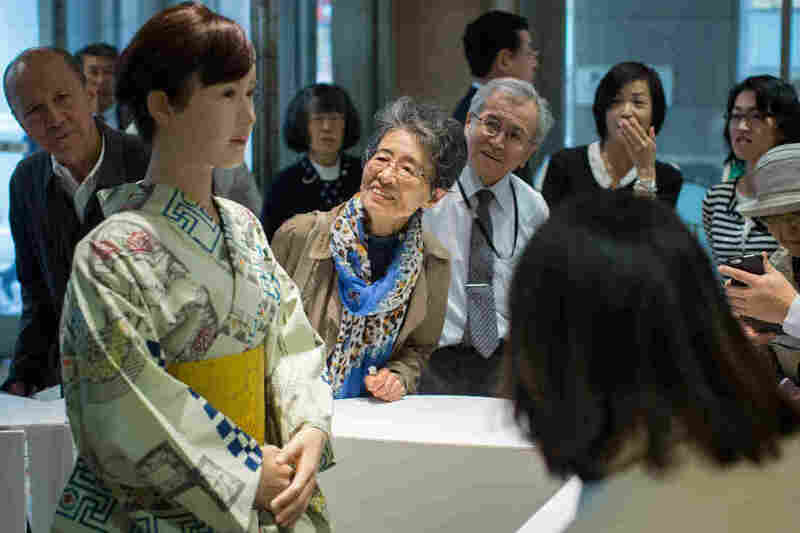 She's Almost Real: The New Humanoid On Customer Service Duty In Tokyo : All Tech Considered In Tokyo, a stylish new department store receptionist isn't a human at all. It's a lifelike silicone robot with movements so real, it's fooling some customers. Shoppers view and take photographs of humanoid robot "Chihira" at the information reception desk of Mitsukoshi department store in Tokyo. The latest robot sensation in Japan is so lifelike that when she was on the floor of a Tokyo department store recently, she was confused for a human being. The new humanoid's name is Aiko Chihira, and she was working in customer service, clad in a traditional silk kimono. "She's 165 centimeters [5 feet 5 inches] tall ... and she's supposed to be 32 years old," Hitoshi Tokuda says. He's Toshiba Corp.'s head of new business development, who led the making of Chihira with a team of programmers. "Her movement is done by 30-times-per-second data [transfers]," he says, and she's powered by 43 motors. So Chihira's movements — like bowing or blinking — look subtle, and her silicone body looks more wax figure than R2-D2. Even in Japan, where new releases of robots are common, she was a surprise for customers like Masayuki Yamamoto. "It's stunning, seriously I never expected this would be real," Yamamoto says. "I thought, why on earth are all these people taking a picture of a receptionist? I looked at her carefully and I realized it was a robot." When NPR visited Chihira, she fooled more than a few folks into thinking she's real. That trick of getting a robot to look human, without winding up in the uncanny valley that scares children, is a difficult balance for designers. Toshiba's Tokuda says it was his team's biggest challenge. "Eighty percent humanlike is very scary. So it has to be 90 percent or close, or very close to perfect," Tokuda says. Chihira's lifelike enough to be a hit, drawing people like Chiho Gomi who showed up not to shop, but to see the android. "Of course I feel more comfortable with real people, but she's interesting," Gomi says. All the interest in Chihira has Toshiba planning to give her some sisters. The Japanese birth rate for humans may be dropping, but this is still fertile ground for making robots. Chie Kobayashi contributed to this story.